The definition of Plein Air or en plein air, is a French phrase that translates "in the open air". This term is used to describe paintings that have been created chiefly outdoors, rather than in the studio. Photo reference is not used. The roots of plein air painting from life are found in 19th-century Europe with John Constable and at the same time the Barbizon group near France with their sketch books in hand outside in the natural life combined they laid the ground work for the Impressionist Giants, Claude Monet, Edouard Manet, Winslow Homer, Camille Pissarro, and John Singer Sargent. Who challenged and revolutionized the truth of the eye, form, light and color. Plein air's popularity has been aided by the development of easily portable painting equipment and materials. Such as the pochade box and the wonderful ingenuity of artists, from tackle boxes to backpacks, if they can pack it they go and find it. Artists continue to invent ways to transport themselves and their supplies to a site that begs to be captured. Alla Prima is a title given to artworks that are created completely, in one session on site, from start to finish. Completed on site is to be used for a work where more than one session is used to complete the piece, there should be no more work done once the painting has left the site. Their are still some works that can be considered plein air where no more than 10% of the finished work is completed away from the inspiration in the studio. It is up to the artist to specifically and honestly describe their work, and state the plein air level of completion regarding their work. Any and all outdoor, on site works. Contemporary plein airists create cityscape, landscapes, portraiture, figurative, poetry and wildlife. With the freedom and creativity of today, plein air works can be very representational, figurative, romantic, luminous, poetic and even abstract. What medium is primary to plein air? Paper, Canvas, pen & ink, scratch board, oil, acrylic, and watercolor paints, hard/soft/oil pastel, colored pencils even crayons could be used, that is left to the artist to choose their weapon for executing the changing moments they are after. Why outside, wouldn't it be easier to work from a photograph in the studio? Sure it would be easier to work from a photo, but that would take the life and fun out of why you would choose plein air to begin with. It would defeat the entire purpose. The difference between working plein air and from a photograph are akin to the difference between seeing your favorite band live in concert or listening to a cd. Plein air painting is a passion like none other. It takes complete concentration to the point of unawareness of self. It takes training every sensory nerve, to a heightened awareness of time, color, light, temperature, sound, sight, atmosphere, and emotion, it takes unparalleled translation from eye, to head to hand to canvas. "There are no two seconds alike in nature!"" A leaf steps with the wind in time, the clouds move swiftly across the sky, trailing their shadows across the land, light, dark, bright, calm.Flitter flutter like quiet clapping, the flowers brush against each other and whisper "try to catch me", Peek a boo, Look up the sun has moved, see how the shadows change." Like a great waltz or a superb game of tag.. these are the results of an artist and nature combined. This article has been published and can be found on eBay Guides. 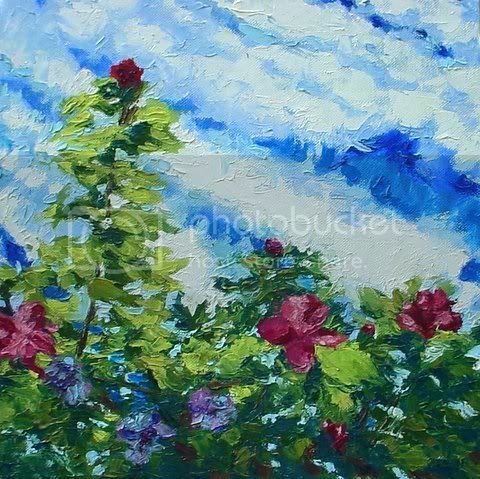 Plein air oil painting of a flowering Rose of Sharon - Lucy.